The state sponsored campaign of unfair vilification and cruelty against grey squirrels has now reached the point where thousands of these well-loved, friendly and amusing animals are about to be trapped and clubbed to death. This will include the indiscriminate killing of lactating females, which will mean their kittens will starve to death in their dreys - and it is being called "humane". So what can members of the public, who disagree with this approach, do to counter this bloodshed without the money machine of government behind them? Landowners and gardeners can refuse access to trappers and feed grey squirrels where traps are known to be in the vicinity. 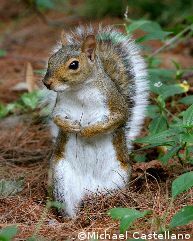 The latter is known to work in a location where for the past two years grey squirrels have been trapped without any effect on their population level, as they will stay close to where they are fed. It could even increase their fecundity. Trap entrances can also be effectively blocked by something like heavy stones to render them useless but on no account should they be damaged as this could result in a criminal prosecution. "Save a Life, Feed a Grey" poster!